Until the final two games of the spring, there were no hints of what he would do in the Mariners’ opening three-game series — go 5 for 8 with two home runs, a double, two walks and three RBI. 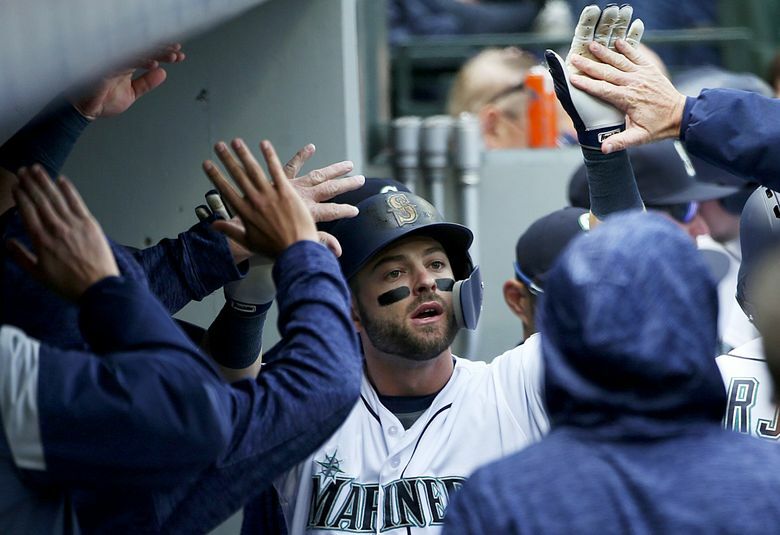 The torrid start to Mitch Haniger’s 2018 season actually began in the final days of what had been an interrupted and somewhat frustrating spring training. Because, until the final two games of the spring, there were no hints or signs of what he would do in the Mariners’ opening three-game series — go 5 for 8 at the plate with two home runs, a double, two walks and three RBI. “Timing feels good, swing feels good and now I’m just trying to hunt my pitch,” he said. Haniger probably wouldn’t have said those things midway through spring training. His normal routine was sidetracked by aching tendinitis in his right hand, which forced him to take a week off from swinging the bat. It’s something the ultra-regimented Haniger found beyond irritating. There is no player on the Mariners’ roster who takes his daily work more seriously. He couldn’t hit. He couldn’t get game at-bats. Still, when his hand finally stopped aching and he was cleared to return to his normal daily work and game action, it wasn’t quite the same as expected. A stretch of eight games from March 15 to March 25 yielded just three hits in 24 at-bats with eight strikeouts. With opening day getting closer and closer, Haniger was searching. He was missing balls he should be driving. He was hacking at pitches he shouldn’t even consider. He just didn’t feel right. He was stuck “in between,” the dreaded purgatory that no hitter wants to occupy for more than an at-bat or two. In between to hitters is when you feel like you’re late on fastballs and way out in front on breaking balls. The load is when Haniger triggers his swing and gets his hands into the hitting position. It’s absolutely critical to be consistent in the load. If it isn’t, everything else that follows will be out of sync. Haniger could feel it, but went to the video to verify it. It might not have been noticeable to the average fan, but it was to Haniger, who has studied and analyzed his swing since making a commitment to changes during his time with the Diamondbacks. For Haniger, the changes came in his setup at the plate. He was in a better position in his setup, which got his swing load going sooner, which felt normal. But normal doesn’t mean immediate hits and homers. It’s part of the tortured existence of a hitter. Haniger’s best results came in the final game of the spring. While his fellow teammates on the 25-man roster took an at-bat and played two innings and called it good, Haniger played seven innings, getting three plate appearances and ripping a pair of doubles. But it was more how he felt at the plate on those doubles that allowed him to feel confident going into the season. The rest was a bonus. Identifying the problem doesn’t eradicate it. That comes with time and repetition. And even then it isn’t simple. • The Mariners announced their minor-league rosters for their affiliates throughout the organization. But Evan White’s name was absent from any of the rosters. The Mariners’ No. 2 prospect is dealing with a groin strain, according to general manager Jerry Dipoto. White is expected to miss the first week of the season and then return. • Outfielder Cam Perkins was outrighted to Class AAA Tacoma and removed from the 40-man roster. Perkins was claimed off waivers in the offseason. Seattle now has 38 players on its 40-man roster.